Over the 1990s, Britain’s grid electricity decarbonises as a tremendous pace, leaving Germany far behind. As is widely known, this was largely due to the “dash for gas” following privatisation, driven by low gas prices and new rules that allowed gas turbines in power generation. However, since the end of the 1990s that decarbonisation has come to a grinding halt (actually reversing through much of the 2000s as the use of coal came back in as gas prices started to rise). 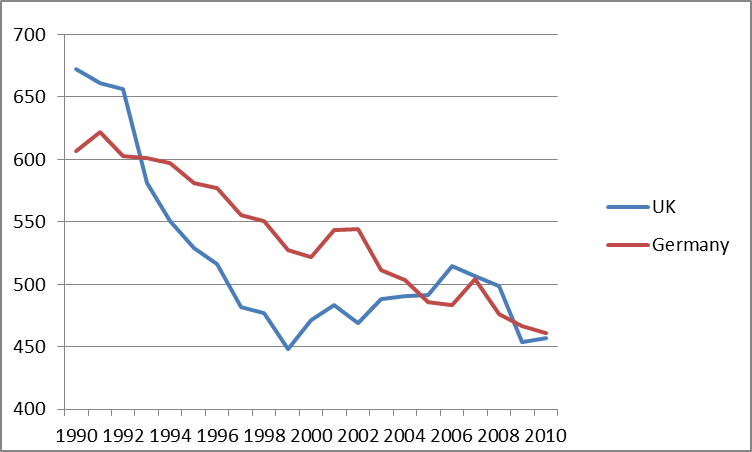 Between 1990 and 2000, the UK’s grid carbon factor fell by almost 30%, but in the decade 2000 to 2010, it fell only 3%. By contrast, while Germany’s decarbonisation trend has been slower, is has been sustained, with the grid factor falling by 14% in the 1990s and almost 12% in the 2000s. The German tortoise has now caught up with the UK hare. What explains these differing pathways? My guess is that it is to do with the political dynamics of deep shifts in electricity systems. The UK took the route of maintaining centralised power generation and switching to gas, but has had a fairly difficult time getting fast growth in renewable energy. This route has been cheap (whether it continues to be so in future depends on the price of gas), but hard to sustain. A major part of the underlying reason for this is that the system remains highly centralised and in the hands of large companies that are generally unpopular with the public. There is support for renewable energy, but that support is quite thin, in the sense that people feel much of the benefit of policy support goes to developers and large generating companies. In Germany, by contrast, decarbonisation has been driven by a much deeper penetration of renewables, but these are largely in the hands of individuals, farmers, small businesses, cooperatives and municipalities. This creates an enormous constituency that has a vested interest in renewable energy, added to by the fact that Germany has engineered an industrial policy that means that a lot of the equipment installed is made by German workers. Critics often point out that this has been an expensive way to do things, which is true looked at from the point of view of the marginal cost of CO2 reduction in €/tCO2 (although the cost of the renewables policy support mechanism in Germany has been lower than in the UK). But from the perspective of longer term dynamics, this is to miss the point, which is how far the process can be sustained politically. In Germany, the negative “policy feedback” effects from policy costs on the politics of renewable energy is still largely outweighed by the positive feedback effects, whereas in the UK, positive effects are very weak. The UK will see a further dip in grid carbon factor in the next few years, as coal plants come off line under European legislation aimed at stopping acid rain. It is hoped that there will be a massive boom in offshore wind, which should also further reduce the grid factor (and possibly a new nuclear plant). But serious questions about the political sustainability of these changes remain. As the carbon factor goes lower, decarbonisation becomes deeper, and requires more radical change, political support for change becomes central. 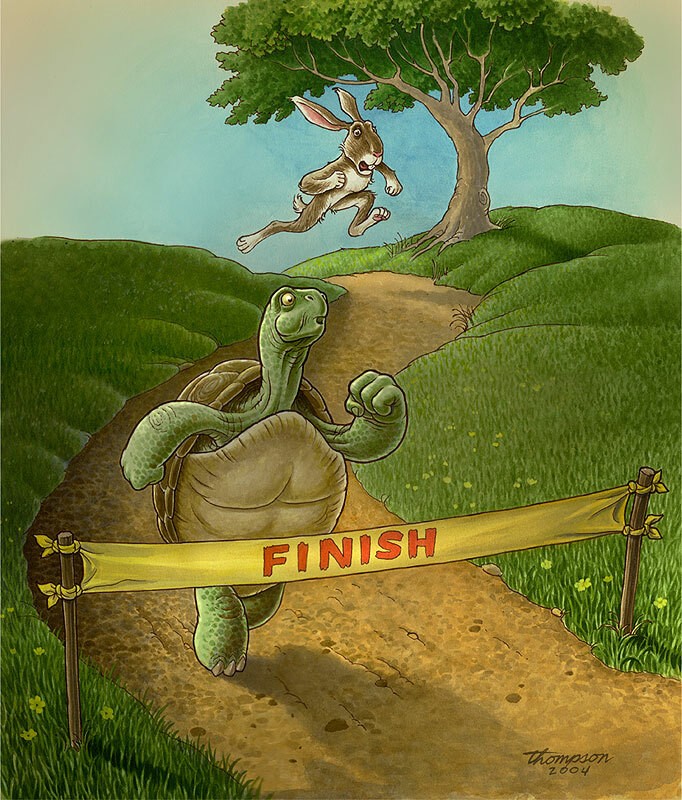 Will the hare speed away again, or will it remain dozing and be overtaken by the tortoise? This race is an interesting contrast between two very different paths towards a low-carbon electricity future.